The 28 metre motor yacht High Energy, listed for sale by Matthew Palmer at Sunseeker Monaco, has been sold with the buyer introduced by Richard Higgins at Camper & Nicholsons International. Built in GRP by British yard Sunseeker International, High Energy was delivered in 2014. Luxurious accommodation is for eight guests in four cabins comprising an amidships master suite, VIP suite, double and a convertible twin, and all have entertainment centres, television screens and en suite bathroom facilities. The saloon has a large settee and coffee tables to port, while to starboard is an entertainment centre including a 55-inch Samsung television screen on a rise and fall mechanism and a stereo surround sound system. Forward is a bar and liquor cabinet and a dining area with seating for eight guests. Al fresco entertainment and dining is available on the aft deck with built-in upholstered seating, a fridge and ice maker, while the flybridge comes with a bar, fridge, barbecue grill, flatscreen television and a dining area shaded by a carbon fibre hard top. On the foredeck, two large sun pads and comfortable seating areas give yet more space for al fresco dining. 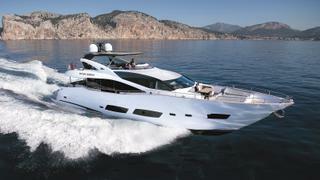 Twin 1,950hp MTU engines power her to a maximum speed of 26 knots and a cruising speed of 23 knots. High Energy was asking £3,250,000.